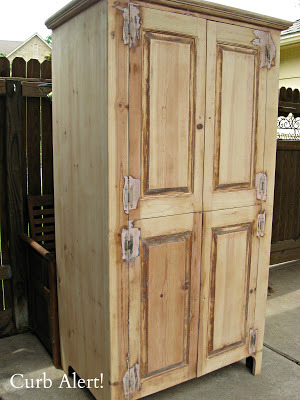 Thank you so much for you comments about Buttercup’s Armoire. I think you all had some great ideas. Although I LOVE Rita’s idea about ditching the original plan to try and find an alternative for Buttercup and keep it for myself, I decided to compromise and stick with the purple plan. Yes, that is LadyBug photobombing my picture saying, “Mom WHAT IN THE HECK are you thinking!!!???!! !” I truly must have been missing some marbles this weekend when I was in Home Depot and agreed to let Buttercup choose whatever paint swatch she wanted instead of persuading her towards a different shade. I actually bought this color and let her test it and paint the drawer herself! After looking at it for an entire two seconds I just could not go through with it. 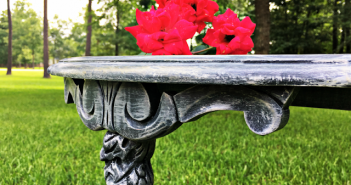 I shared my frustration with my neighbor and she offered up some old leftover paint that she used years ago on her granddaughters furniture. A much lighter and more tolerable shade of purple! Now Buttercup is happy and Momma is happy…until Momma got a little creative and started trying to distress it with the sander. Then I tried to glaze it. I have been itching to try glazing and definitely was “winging it”. So far I liked it but was a little sketchy as to whether I was completely in love. I decided to finish what I started just to see how it turned out. I had to keep going because I was having a hard time visualizing what the entire piece would look like. I love the effect but the color was continually throwing me off. The glaze is Martha Stewart brand Black Coffee Metallic Glaze. Here is the final piece and now Momma is NOT happy! It looks cool and sort of like old driftwood and beachy, but every time I look at it I envision that someone will think that I drug it out of a fire (or a dumpster, for goodness sakes!). It truly looks like it was rubbed with soot! I THINK I may go back to the plain white and try to embellish it somehow. 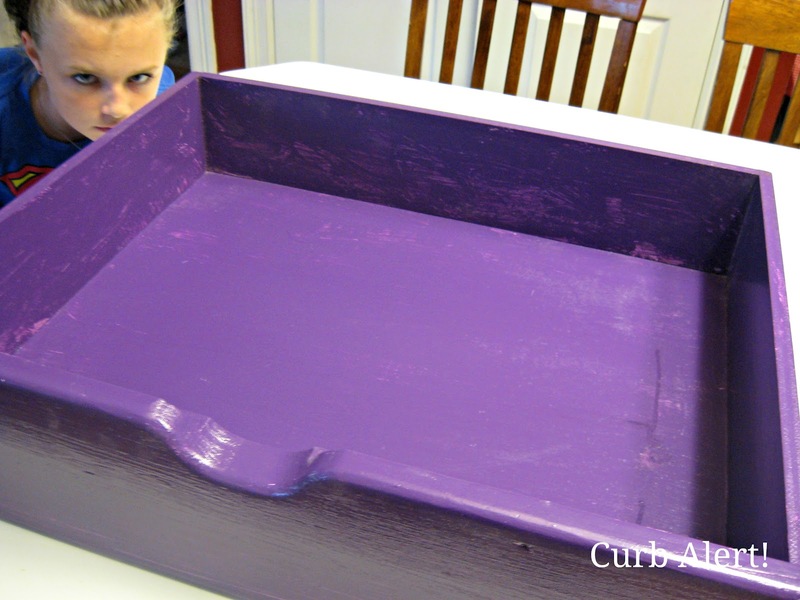 BTW…Buttercup LOVES the lighter shade of purple but she hasn’t seen the glazing effect yet. I hope she doesn’t think I tried to set it on fire! If that is not the look you were going for you can always sand it bit, glaze is fairly thin. You might even try washing it off. You could dry brush it with the base color covering some of the glaze. Either would work. I am always afraid of too much glaze so I tend to mix it weaker. I have no idea if that is the correct word but what I mean is more uncolored glaze and less paint. You can buy untinted glaze at any paint store or home inprovement store these days. I have seen people glazing with blue or green and I am wondering how using the dark purple in the glaze would look. And maybe adding in a little pearl. Can't wait to see what you do. I'd recommend using a different color glaze. I have a tan color and it makes a nice aged, slightly dirty look. 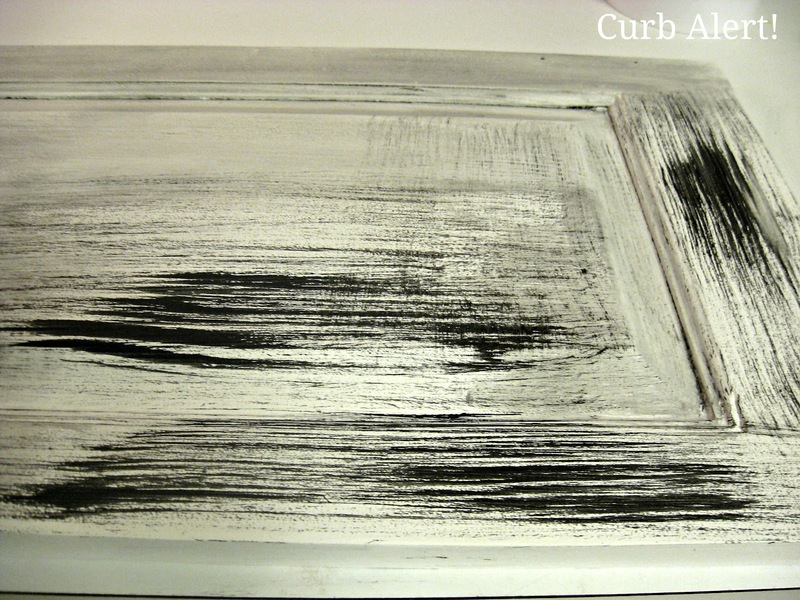 I think a gray/silver glaze would look awesome on this piece, and go well with the purpley interior. good luck, and the inside looks awesome! Go back to the bright white. I lvoe the picture where you can see the inside light purple with the outside white framing it. Definitely begging for the bright white finish. To embellish you could get Buttercup some wall stickers (even Dollar Tree has them) and let her go to town. Well I don't know anything about glazing but I did like it before it was glazed. The white and light purple looked really nice. Tami, you won't believe me when I tell you I am going through the same thing!!!! 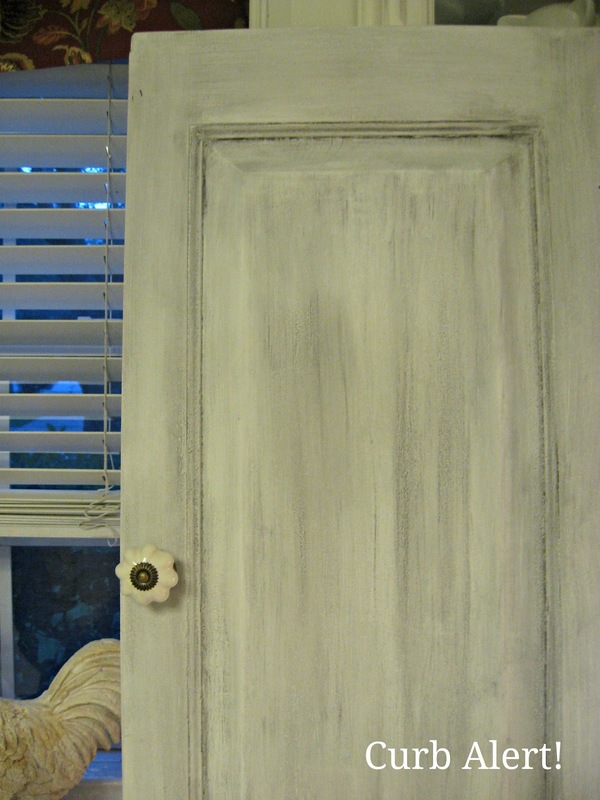 My daughter and I just finished painting her armoire in a light sea green color to go with her PB linens. It looks great, but we feel like it needs something. We have also been thinking about doing some glaze, but I have never tried this before. 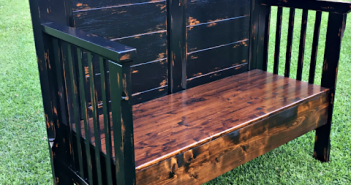 I have been reading about it and found a tutorial where a blogger mixed 3 parts Valspar Clear Mixing Glaze with one part Minwax Walnut Stain and the cabinet came out beautiful. Now, it has taking us three days to paint this piece of furniture, so I am scared to death to ruin it. 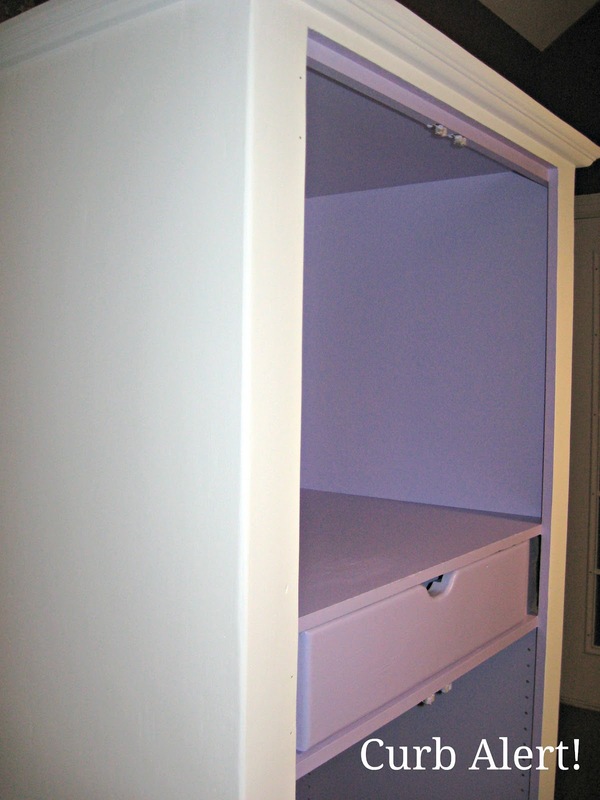 For your daughter's room, I think also that all painted white with the purple color on the inside will look beautiful. Have you thought of maybe stenciling the outside of the doors with a pretty design? I will email you a picture that I found for some inspiration. I am thinking of maybe doing something like that. I cannot get glazing down to save my life. I see so many cool projects, attempt to duplicate and end up with a huge ugly mess. Even my attempts at distressing have turned a hot mess. I think I am heavy handed and have to remind myself that "less is more". 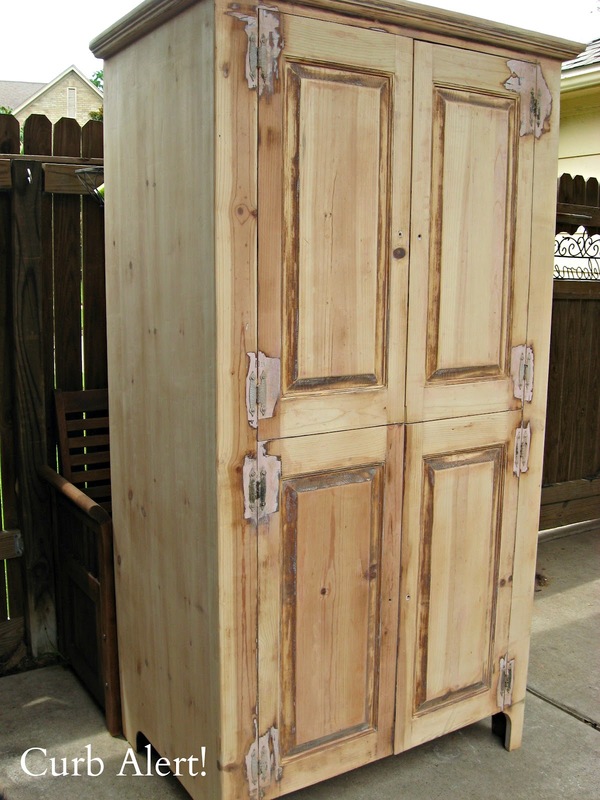 Can't wait to see how you remedy you armoire. I like the idea of the outside being white with a stencil design, and leaving the inside purple, there are so many great ideas here, good luck!!! Glad you liked my suggestion and I love Buttercup's eyes in that picture! I have to agree with liking the bright white on that lavender color. 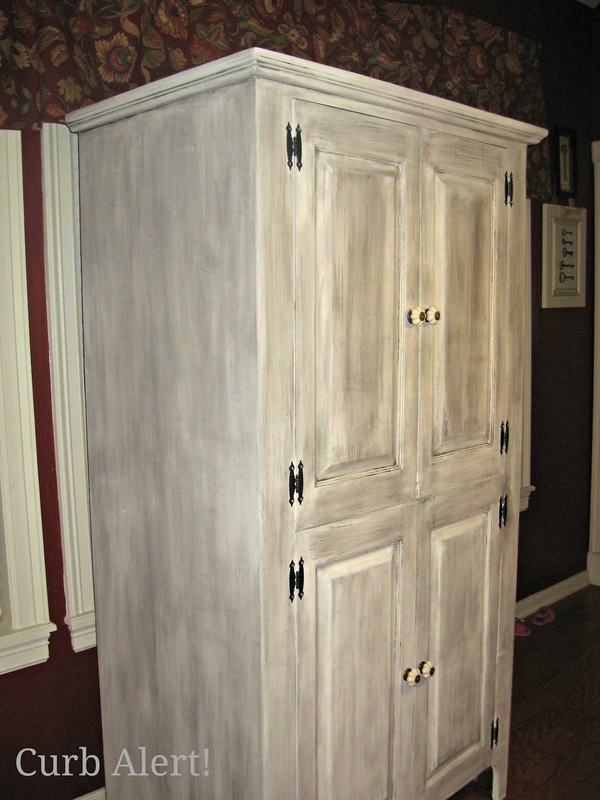 I think it looks beautiful and you can always embelish with purple knobs or an easy stencil. This is really cute! I do agree with a couple of the others who say to go back to the bright white. Try stenciling some purple swirls on the out side. 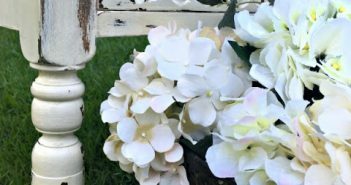 You could also go to just about any craft store and pick up wooden shapes such as daisies, hearts, ect and paint them and then glue them to the outside. A couple hooks that she could hang things on would also be cool. I'm stopping by from financial Friday to say hi!